Many kids who are high school freshmen this year weren’t yet born when 9/11 happened. For them, the deadliest attack in American history feels like Pearl Harbor did to Baby Boomers, like the Kennedy assassination did to Gen Xers and like the fall of the Berlin Wall did to Millennials. It feels a bit like ancient history. But America’s current history teachers — the first generation of educators to tackle 9/11 in the classroom — feel a personal responsibility to pass on the lessons learned from Sept. 11, 2001 to today’s kids. How does one squeeze arguably the most pivotal day in modern U.S. history into an already tight lesson plan? We spoke with history teachers from different parts of the country to find out how they are keeping the tragic memories of 9/11 relevant for a new generation of Americans. Perhaps it’s not surprising that a group of fifth graders in South Carolina don’t know much about 9/11. But what about high school juniors in Washington, D.C. — one of the cities targeted by a hijacked airplane that day? “Some of the parents really don’t know how to start talking about it, so they leave it up to teachers to know the most appropriate ways to talk about it,” Huffman said of her experiences. While history teachers in many parts of America are tasked with being the first people to introduce children to the horrors of 9/11 every school year, educators in New York likely find the topic is still fresh in the minds of their students. Robinson said that while all of his students are aware of the fact behind Sept. 11, every year he can count on at least one student who has a “rabid fascination” about the attacks. “I had a kid this past year who knew all the flight numbers and where they took off, where they were headed,” Robinson said. Although advanced knowledge about 9/11 may be mostly limited to kids in New York, interest in the topic seems to be universal, at least according to the teachers with whom we spoke. “They’re definitely interested in it. And it surprises a lot of them,” said Jennalee Kwezi, a 10th-grade history teacher in Houston, Texas. SHOULD KIDS SEE THE GRAPHIC IMAGERY OF 9/11? It’s tough to blame those past students for not engaging much when lessons about 9/11 came up. The attacks happened in the early days of the 24-hour news cycle — Fox News and MSNBC were only five years old — and in the infancy of online news. The stunning video and photography from that day were virtually inescapable. But when teachers show today’s kids the raw images from 9/11, many are seeing them for the first time. 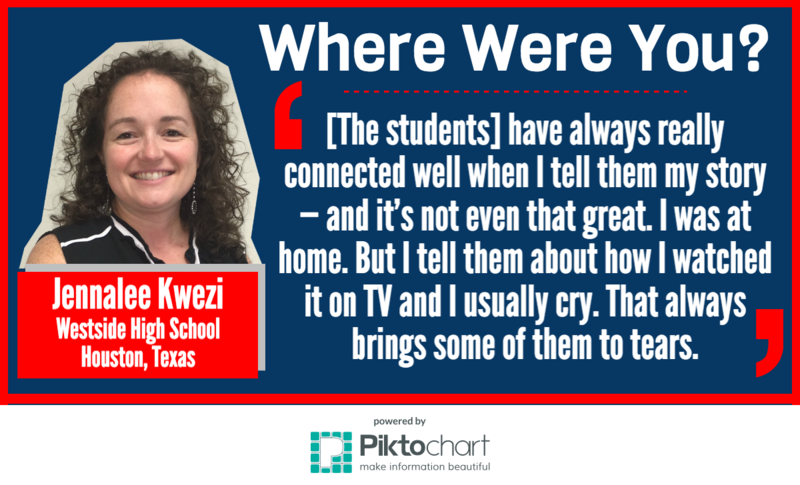 Kwezi said she shows her students CNN’s coverage of the attacks — including video of the twin towers falling in New York — but she avoids showing clips that depict trapped people jumping from the towers after the planes had hit. She said the images invariably “shock” her students. All the teachers we spoke with agreed the graphic images from Sept. 11 are an integral part of educating students on the attacks. “The images always help,” Fox said of engaging his students at Washington’s Cardozo Education Campus. Huffman also uses clips from the 2006 Hollywood film “World Trade Center” as an introduction to the topic, showing the devastation and how people were buried in rubble from the collapsed buildings. At Harlem Academy, Robertson takes advantage of his classroom’s close proximity to the primary attack site. He takes his students to the 9/11 memorial every year, but only after showing them the 2011 documentary “Rebirth,” which follows the lives of people who lost loved ones in the attacks. He said the movie gives the kids a few names to look for when they visit the memorial. Robertson starts his 9/11 chapter with the opening clips of Michael Moore’s 2004 documentary “Fahrenheit 9/11,” which also show the devastation of New York City on that day. He stops the film “before Moore starts editorializing a little bit,” Robertson said. Fox conceded “there’s some great information in ‘Fahrenheit 9/11’,” but said he’s never used any feature films in class when talking about the subject. He recommends his students check out 2006’s “United 93” or 2002’s “WTC: The First 24 Hours” in their free time. 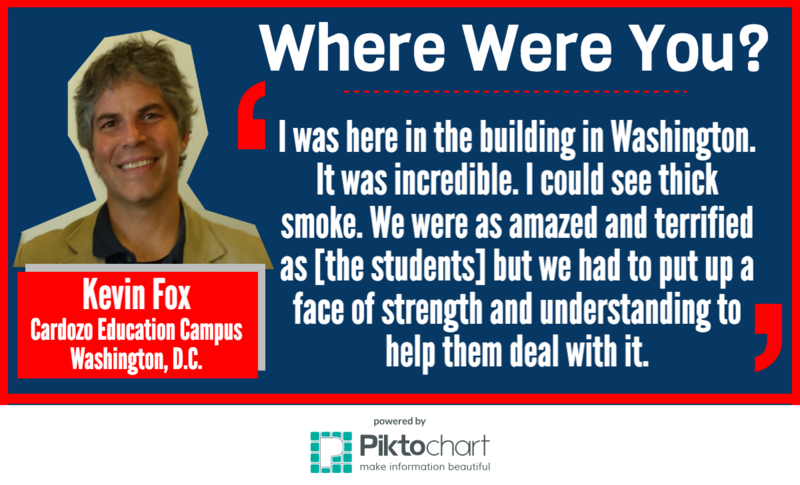 This year, Fox is taking a nontraditional approach to teaching his students about 9/11. In late September, he’s taking them to see a musical called “Come From Away” at Washington’s historic Ford Theatre. The show is based on the true story of a small Canadian town that saw its population double on Sept. 11, 2001, when dozens of planes were forced to land there after rerouting because of the attacks. Three of the four teachers we interviewed were national award-winning educators and all of them are highly regarded by their past and current students, based on online reviews. They’ve found unique ways to make 9/11 an engaging topic for kids who were too young to have their own memories of the attacks. They suggested a surefire way to connect today’s students with Sept. 11: Make it personal. “I usually cry when I tell the story [of 9/11] and that always brings some of them to tears because it makes it a little more real for them,” Kwezi said. Of the teachers we interviewed, her classroom at Houston’s Westside High School is the farthest from any of the Sept. 11 attack sites. But she finds that survivor stories seem to transport her students to ground zero. 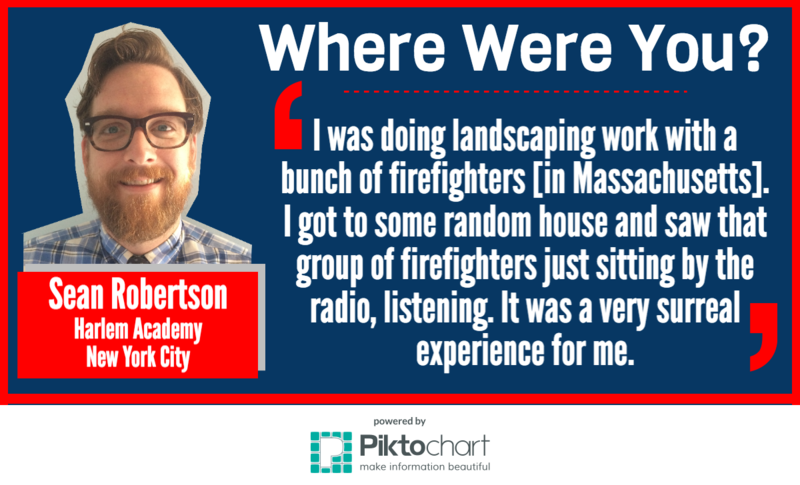 Having students interview people they know, in order to get a better understanding of Sept. 11, is an assignment that also seems to work in classrooms that are much closer to ground zero. Robertson said he uses a similar method, asking his students to interview someone who was at least 18 years old when the attacks happened. Robertson takes the idea of having his students play historians literally. For one assignment, he has the kids fill the role of Alice Greenwald, director of the 9/11 Memorial Museum. The students are asked to weigh different artifacts of the 9/11 narrative — a pair of bloody shoes and mugshots of the hijackers, for example — and to figure out what should be included in the museum and what should be left out. He tasks them with arguing for their various inclusions and exclusions and to convince undecided students to join their side. “The kids have to then grapple with the judgement call of, ‘How does this fit in with the story of 9/11, while also considering the feelings of victims’ families. How do you tell the story of that day, while keeping the idea of empathy? How do you not retraumatize people but tell the story?,” Robertson said. Robertson has done this lesson for the past three years, and it’s part of the reason he was named New York state’s best history teacher of 2016 as part of the Gilder Lehrman Institute of American History’s National History Teacher of the Year awards. 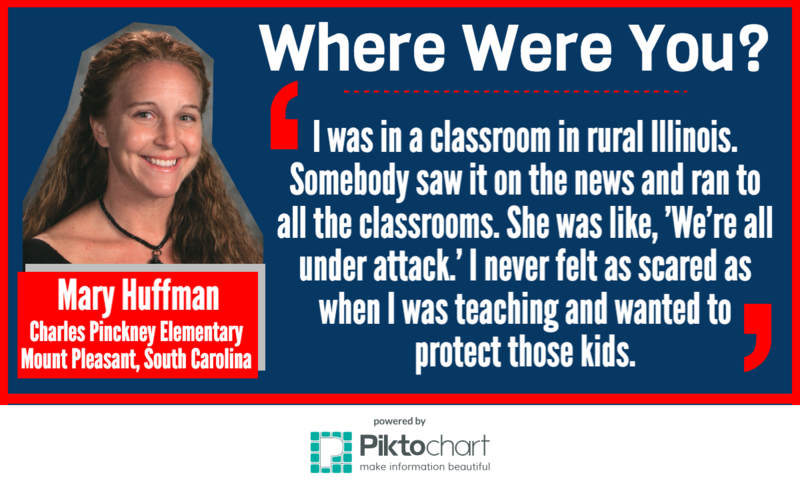 Perhaps unexpectedly, Robertson has yet to have a student who lost a direct family member on Sept. 11 — but in her South Carolina classroom, Huffman had one student whose father was killed. Huffman’s classroom is full of historical artifacts, ranging from World War I military uniforms to a set of railroad tracks from the 1800s. She described the room as looking “like a museum.” One of those pieces of memorabilia is an American flag from the 9/11 Memorial Museum that contains the names of all the victims. “One of my girls, her dad died in 9/11. He was a firefighter and was killed right before she was born. She spoke about it and we cried when she talked about her dad,” Huffman said. “The little girl looked up at the flag — and even though there are 3,000 names on it — in about one second she found his name. We were all stunned. She was crying because she couldn’t believe she found it that fast.” She now has a picture of that student hanging under the flag. Other artifacts Huffman uses when teaching 9/11 are newspapers and magazines from the days and weeks following the attacks. “We analyze different articles in them and the students really get a firsthand account of how we felt as Americans during that time,” she said. Driving home the idea that terror is not limited to Middle Eastern groups like al-Qaida or ISIS, Fox — whose students are predominantly African-American and Latino — compares those groups to America’s Ku Klux Klan when speaking to his students. Perhaps the blunt nature of his style is one of the reasons Fox was named the District of Columbia’s best history teacher of 2016 by Gilder Lehrman. A look at Mary Huffman's classroom in South Carolina. She describes the room as being "like a museum." Its walls are adorned with historical items. Tensions toward American Muslims and those of Middle Eastern descent have been high since 9/11. The ongoing Iraq War and America’s fight against ISIS have kept anti-Muslim sentiments prevalent 15 years after the attacks. Today’s history teachers see themselves as a barrier between impressionable students and the onset of prejudice. For her students in Mount Pleasant, South Carolina, Huffman uses an extreme style of historical role playing to teach tolerance. “Fifth graders are not as worldly as [older students], so I have to really make sure I make the big point that we are not fighting against Afghanistan, Iraq and Iran, we’re fighting against some terrorists who live inside those countries,” Huffman said. She does an activity that attempts to put her students into the skin of a Middle Eastern Muslim. Huffman has her female students wear chadors and burqas for an entire day, covering their heads and faces even while they walk the halls outside of class. During the activity, the girls have to stay at the back of any lines, while boys go to the front. Huffman, who earned Gilder Lehrman’s top prize of National History Teacher of the Year in 2015, says she hasn’t heard complaints from parents about her 9/11 lesson plan. Earlier in the school year, she does a similar role-playing exercise when teaching about the Holocaust, where she has the kids adopt the identity of a Jewish victim. She said she’s seen the success of her 9/11 role-playing lesson firsthand. WHAT SHOULD TODAY'S KIDS TAKE AWAY FROM 9/11? While each educator has their own methods, the teachers we spoke with all agreed that citizenship and an expanded worldview are the key takeaways for their students after a lesson about Sept. 11. The ongoing implications of 9/11, as well as the cause-and-effect relationship it has with today’s America is a major part of the lessons of both Kwezi and Robertson. “It’s our history and it connects with what’s going on still in the world,” Kwezi said. Clint Davis is a reporter for the Scripps National News Desk. Follow him on Twitter @MrClintDavis, and follow his team @ScrippsNational.